I am grateful beyond words for the example of the lanterns shared in this memoir whose lives I hope will illuminate my children’s, your children’s, and the paths of countless others coming behind. 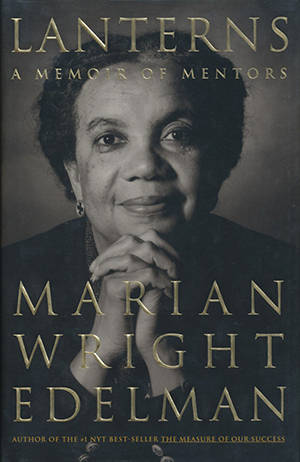 Marian Wright Edelman, “the most influential children’s advocate in the country” (The Washington Post), shares stories from her life at the center of this century’s most dramatic civil rights struggles. She pays tribute to the extraordinary personal mentors who helped light her way: Martin Luther King, Jr., Robert F. Kennedy, Fannie Lou Hamer, William Sloane Coffin, Ella Baker, Mae Bertha Carter, and many others. She celebrates the lives of the great Black women of Bennettsville, South Carolina-Miz Tee, Miz Lucy, Miz Kate-who along with her parents formed a formidable and loving network of community support for the young Marian Wright as a Black girl growing up in the segregated South. We follow the author to Spelman College in the late 1950s, when the school was a hotbed of civil rights activism, and where, through excerpts from her honest and passionate college journal, we witness a national leader in the making and meet the people who inspired and empowered her, including Dr. Benjamin E. Mays, Howard Zinn, and Charles E. Merrill, Jr.
Lanterns takes us to Mississippi in the 1960s, where Edelman was the first and only Black woman lawyer. Her account of those years is a riveting first-hand addition to the literature of civil rights: “The only person I recognized in the menacing crowd as I walked towards the front courthouse steps was [a] veteran New York Times reporter. He neither acknowledged me nor met my eyes. I knew then what it was like to be a poor Black person in Mississippi: alone.” And we follow Edelman as she leads Bobby Kennedy on his fateful trip to see Mississippi poverty and hunger for himself, a powerful personal experience for the young RFK that helped awaken a nation’s conscience to child hunger and poverty. Lanterns is illustrated with thirty of the author’s personal photographs and includes “A Parent’s Pledge” and “Twenty-five More Lessons for Life,” an inspiration to all of us-parents, grandparents, teachers, religious and civic leaders-to guide, protect, and love our children every day so that they will become, in Marian Wright Edelman’s moving vision, the healing agents for national transformation.